You are here: Marine Parts » Shop All Marine Products » Products for Your Engine & Sterndrive » Cooling Systems | FWC Kits » Fresh Water Cooling » MerCruiser » Full Systems » Buy the San Juan MC321 Closed Cooling System Online for Mercruiser 1997-2001 Small V8 Carbureted w/ Serpentine Belt & High Port Side Mounted P.S. 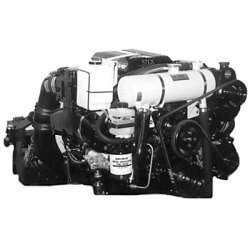 This is a standard capacity Closed Cooling System designed for Sterndrive Mercruiser & GM based 5.0L/5.7L V8 carbureted and TBI (throttle body injection) engines with SERPENTINE BELT & HIGH PORT SIDE MOUNTED POWER STEERING. System works with Vortec engine (8 bolt intake manifold not 12 bolt) and Alpha One or Bravo Outdrive''s. This is a full system, cooling the engine block and exhaust manifolds. System mounts on the front of the engine. Raw water inlet must run up the front of the engine. Will work with carb and TBI engines. Kit comes complete with detailed installation instructions. This kit contains the necessary pump and hardware to provide the required water flow to the engine.